Food is a lot like fashion — With each year comes a host of new flavors and dishes to look out for. So far, 2017 has been no different, with many of the original trend predictions coming true. As consumers seek to combine traditional cooking methods with global cuisines while maintaining a healthy approach, restaurants and supermarkets are starting to take note. But how do you predict what people are going to want to eat? The answer lies in the study of changes in consumer behavior. Depending on what is affordable and accessible, along with what is fashionable for that time, it is possible to forecast what people will want to eat in the “real world”. Social media and viral marketing have a huge impact on what people want to consume as well. An example? The humble avocado. Instagram has made it an essential ingredient for almost all photo-worthy dishes. So, what trends are we seeing so far in 2017? A recent study from Syracuse University found that eating dark chocolate in the morning has unexpected benefits. Apparently, eating the sweet stuff before going to work has a positive impact on cognitive function; specifically, abstract reasoning, memory, and focus. This supports research from Tel Aviv University, which also suggests that having cake or dessert for breakfast also supports weight loss. The results of these two studies have created something of a stir on the breakfast scene, with more people choosing a sweet breakfast over a traditionally savory one. 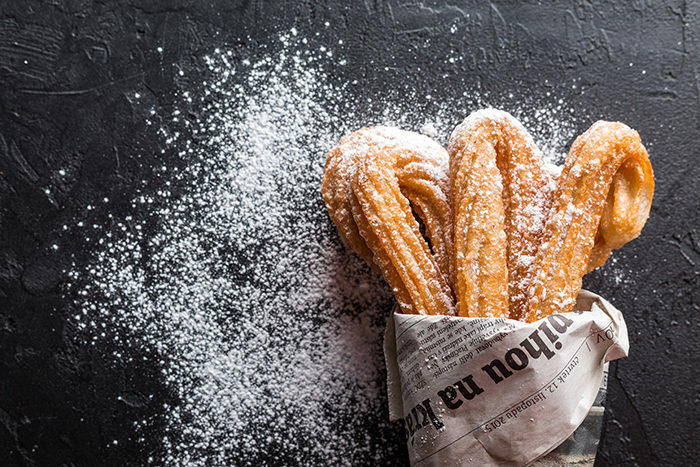 While these results might be relatively recent, the trend for eating dark chocolate with sweet churros in the mornings is a long-held tradition in Spain. Of course, you don’t have to travel all the way to a European destination to grab some traditional churros. You can find a sugary breakfast near you. Turmeric also is on the rise. While it is already a widely accepted addition to most Indian cuisine, it is seeing something of a rise in popularity around the globe due to its anti-inflammatory properties. Food bloggers are touting turmeric as a superfood rich in antioxidants as well as its digestive and cognitive benefits. And they are right; turmeric and its derivative curcumin are clinically proven to reduce pain and symptoms associated with chronic inflammation, much like the effects of ibuprofen but without the resultant liver damage. Turmeric saw a huge upsurge in demand in 2016, and it has continued through 2017 as more coffee shops find ways to incorporate the spice into the hot beverage. and coconut meat all take center stage as star ingredients. Coconut products all boast majorhealth benefits as they provide essential minerals and vitamins along with easily digestible fats. This year has also seen an increase in the use of activated charcoal. This is a black powder that is formed from natural substances such as bamboo, coconut, wood, and coal and has a long history of being used as a potent detoxifier. Added to drinks and smoothies, activated charcoal binds to toxic particles in the body and then removes them so effectively that it has been used for centuries as a primary way to treat patients who have been poisoned. Beware, though, this is not the charcoal you find at the bottom of your barbecue! Food-grade activated charcoal is now being used to create healthy black lemonades and juices that help with bloating and constipation. Last but not least, another huge trend this year is the continued rise in plant-based diets. This has seen an increase in the demand for “plant butchers“. The continued demand for meatless cuisine and plant-based protein has led to the creation of vegan cheese recipes, plant-based milk, and stores that cater only to vegan and vegetarian diets. This trend is something of a cultural turning point and is expected to continue well into 2018.